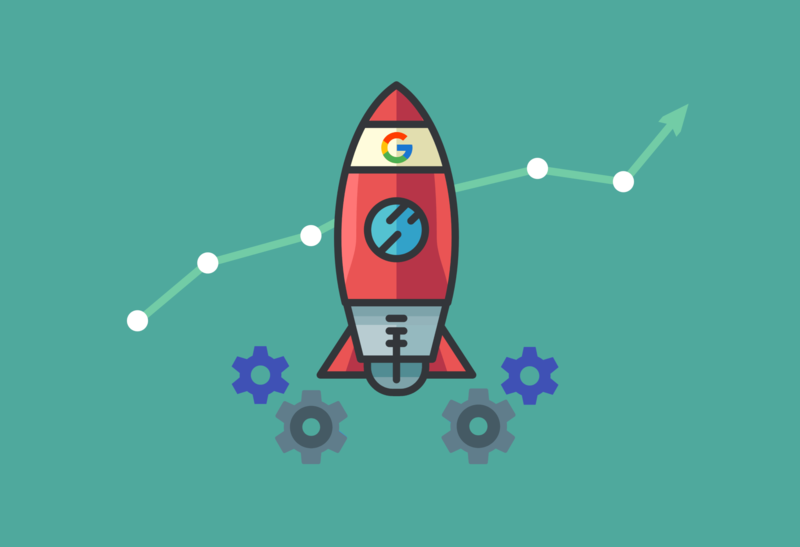 Google Alerts is often used for brand monitoring, but have you thought about using it as a sales tool? Google Alerts have become incredibly popular over the past few years. The increase usage isn’t hard to understand. You can stay up-to-date on news from anywhere in the world, keep an eye on a particular topic, or even find a job that may pay a little better. Even better than the many personal uses of Google Alerts are the potential benefits of using them for your business. 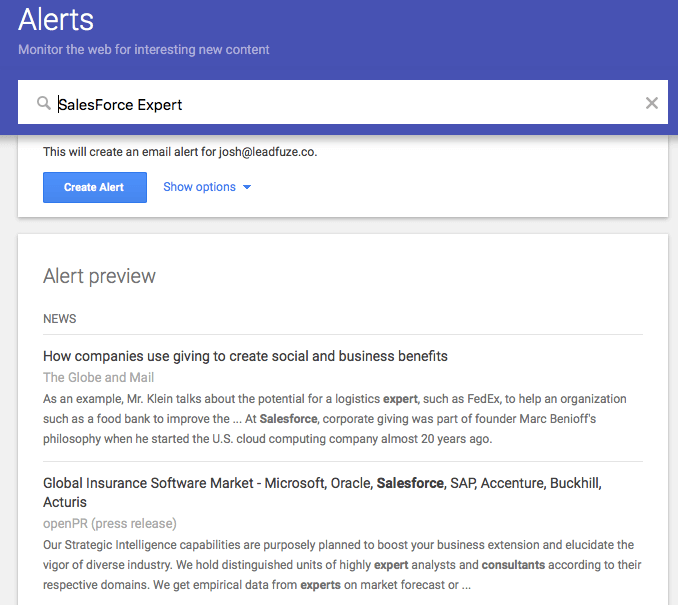 In this post, we’ll focus on using Alerts for lead generation. Some will be more obvious than others. There is more to making revenue than your marketing team and sales reps.
Before we can get into the finer points of fishing for leads using this tool, we’ll first have to go over the basics. There is a bit of set-up involved here, but once things are moving, it will be worth it. Until then, stick with it. First, sign into your Google account and go to the alerts page. It should look something like the screenshot below. Below that, you’ll see a few dozen ideas for the kinds of things that may warrant alerts. Things like music, sports, politics, etc. But for your lead generation, you’ll mainly focus on the “create an alert about…” close to the top of the page. The Main Rule: You have to be specific. Generations being led is talked about much more than leads being generated. The “how to set up google alerts” isn’t so much about the technical details. More so, it’s about knowing the terms that actually bring up good leads. Once you have those, however, you will need some technical search know-how. 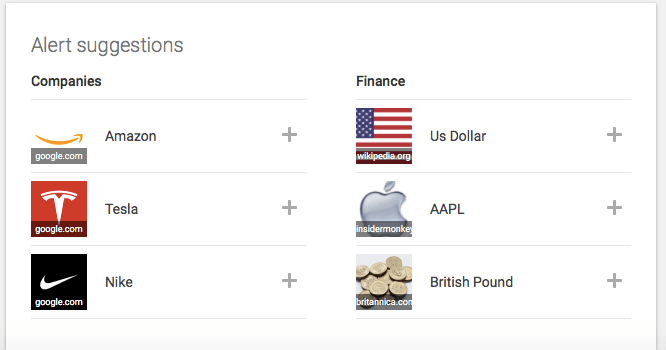 Here are the ways to input your alerts to get exactly the terms you’re looking to see. 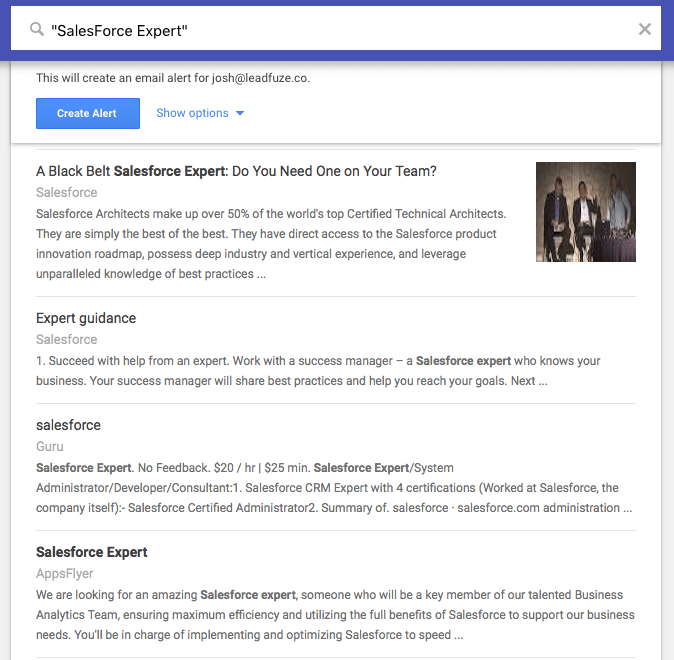 If you want an alert to find people looking for help using SalesForce and just type in all the phrases you came up with, you’ll get everything about SalesForce without specific terms. To do an exact key phrase alert, you have to include quotation marks around the entire term. For instance, “SalesForce Expert” will only yield those results with both words in the exact order. Giving you fewer, yet much better results and alerts. Take a look at the screenshots below (one with and without the exact match “”). There would be a genuine lead from the results above. Without the quotes, there isn’t. Exact Keyword (KW): Most likely will be used for brand reputation/mentions. To search for a single exact KW put a plus sign in front of the word. Example: +LeadFuze, +SalesForce. Alternate Keywords: In the instance there are multiple words that mean or represent the same thing, you can put “OR” in-between words. Example: Lead OR Prospect. Synonym Search: Some words have synonyms that Google actually knows about. To search for these, you’ll use the ~. Example: Searching for “~Owners” may yield results for CEOs and founders. Some of these methods may be referenced throughout the rest of the post, but now it’s onto the lead gen methods. Side Note: Make sure to set up a separate folder (maybe multiple folders) for your alerts. Your inbox could get real hairy, real quick if not. Most of our readers are B2B owners, many of which offer services. We’ve discussed in previous posts about using search tools (i.e. social media, Craigslist, and job boards) to find clients. 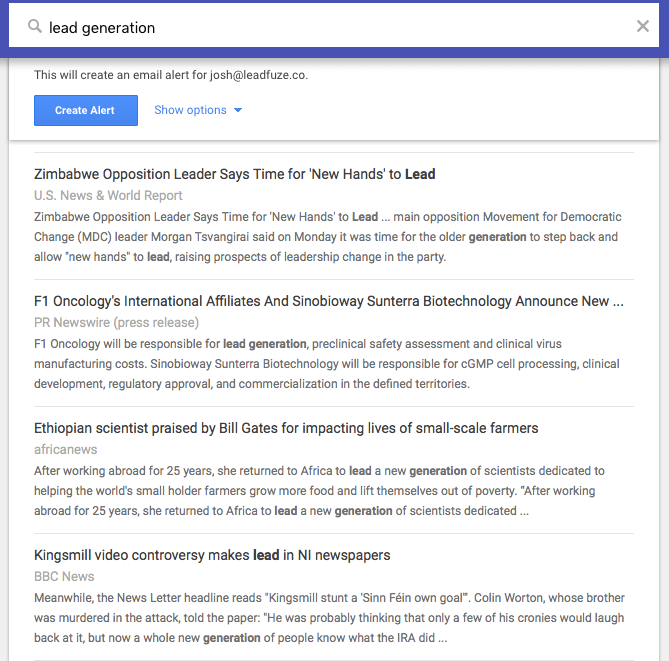 Google Alerts is another way to do this, and potentially more powerful. Why? The majority of businesses don’t post their staffing needs on public forums and job sites. In other words, most people looking for people to do what you do (i.e. web design, SEO, PPC, etc.) post a job opening on their site NOT places like Monster. So, searching the WWW is going to open up the possibilities for finding leads a bit more. Plus! There are likely to be fewer applicants and other businesses trying to sell their services. A PPC expert wants to target companies who are looking to hire a PT/FT Adwords employee. This expert will get companies the results of a dedicated employee at a fraction of the price. That’s the pitch, the proverbial “win-win”. Alerts could be set up to include KWs like “careers”, “hiring”, etc. (in addition to “PPC” and such). Question/Answer Sites: Quora and others like it could be tracked specifically on Google Alerts to notify you of specific KW-related questions. You’ll give a great answer and pick up some lead data. In the News: Most B2Bs have a range of revenue they’d like to see in their leads. Nowadays, seeing the income of businesses is more common than ever. Looking for businesses that are getting a mention for monthly or annual recurring revenue could mean a great lead. Long-Term Tracking: Over a short time, you’ll notice the businesses and their habits. This could help you realize the best time to approach with your outreach. Generating leads via Alerts will likely yield you a handful of quality opportunities every quarter. This likelihood makes it worth it to set up and wait. That said, only using it to generate new leads would be a tragedy. Working with small to medium-sized businesses (SMBs) gives us, B2B folks, a huge opportunity to flatter and follow up with the leads in our pipeline. You think Microsoft cares that they were featured in Forbes (again)? Nope. Not a chance. But what about your clients and leads? Do you even know where they’re being featured? You should. And it’s not hard. Here’s how. Take a look at the leads who have responded in the past, but didn’t buy. Or for the bigger leads that could seriously impact the bottom line. Set up an alert to let you know when their name is mentioned. If it’s good, let them know you care. Not in a stalker way, but “hey, I was reading X and saw Y” kinda way. If it’s bad, let them know you care. Not in a hearsay way, but in a “your brand is being sullied and I thought you’d want to know” kinda way. Taking a look at their website and social profiles tells you about how they want to present themselves at “home”, but getting alerts about them from other places online opens it up to really investigate. You’ll get how others feel about them, how key players interact with the outside world, and a wealth of information about their growth strategy/marketing. You’re not likely to see who’s doing their FB ads or designing their site just off hand. But a simple alert may give you insight into who’s claiming them as their client. Most sites are looking to build up their social proof with an “Our Clients” section of their website, a blog post announcing a big integration/partnership, or just bragging about their acquaintances online. Information is power, especially in sales. Perhaps the most powerful way to generate leads via Alerts is to look for partnerships. Every mention of your brand, every positive comment of your product in a blog post is a potential venue to get in front of an audience that isn’t yours. You write a bangerang blog post that gets mentioned by a business blogger with a decent-sized audience. Getting the Google Alerts for these allows you to thank the person quickly and set up a dialogue. If you’re an agency doing some of the cool stuff we mentioned, how about a referral fee? Or, if you’re an app/SaaS you could offer an affiliate partnership. The possibilities are vast here. If you’re both apps; integrations, JVs, and beyond, you can look for complimentary agencies to partner with and send business toward — or even offer white-labeling (you do the work, their name is on it and vice versa). All from alerts that can be set up once and left alone. Bangerang. It’s important to note that Google Alerts is NOT going to scale your business. Even if you get a client a month (a stretch) and each client is worth a couple grand — it’s not going to pay the bills. Over time, it will more than pay off the initial couple of hours that it takes to set up. But growth will take a multi-pronged, inbound, and outbound methods. Not to sound like a kid’s cereal commercial, but Google Alerts should only be a part of a well-balanced sales and marketing strategy. We, obviously, recommend cold email as one of the most effective ways to grow your business. If you’d like to find out more about using cold email, here’s a great post.